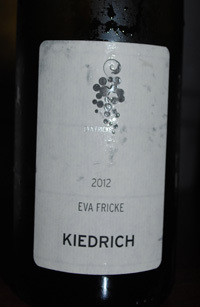 2012 Eva Fricke, Riesling, Kiedrich Trocken, Rheingau, Germany. Another gem from Eva Fricke is the energy filled Kiedricher Trocken, this was my first experience with this wine or area in the Rheingau, and I loved it, this is super fine Riesling. Eva’s 2012 really do show the quality of the vintage, and of course her own talent, this wines have really stepped up a level, and for me are her best yet. The 2012 Kiedrich dry Riesling shows a refinement and polish that shines in this energy filled and exciting wine, this is a Riesling for all occasions with mineral intensity, good depth of fruit, texture and driving acidity. The nose is shy at first, showing a bit of white tea, saline/sea breeze, citrus flowers before giving way to a palate of green apple, white peach, melon, lime and tangerine along with river stones, a cool steely edge and lingering stone fruit and pit. The lime note runs throughout giving vibrancy, but the texture feels soft and balanced. 2009 Daniel Gehrs, Syrah, Central Coast. A stroll down Grand Ave in Los Olivos should include a visit to long time central coast winemaker Daniel Gehrs, he’s been crafting small lot wines from Monterey’s Chalone to Santa Barbara, and doing it well. His Chenin Blanc is one of the best in the state and he does a couple very fine Pinots as well, along with a collection of other wines, including this easy to love Syrah, it’s a no frills, straightforward red that gives plenty of enjoyment and offers a nice value. The nose is ripe and shows a cascade of red fruits, cassis and sweet herbs leading to a full body with plum, boysenberry and candied cherry fruit with hints of dark chocolate, lavender, anise seed and cedary spice. This 2009 is ready to go, no waiting needed, the tannins are silky and the acidity is well folded into the fruit layers, so just pull the cork and enjoy this well made Syrah, again it is not a thinking man’s Syrah, but a fun light hearted red to enjoy on a tuesday night in October, but be sure to check out Daniel Gehrs, he is still making some wonderful wines that deserve some attention. 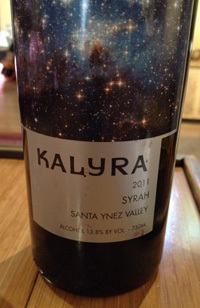 2011 Kalyra, Syrah, Santa Ynez Valley. Walking down State Street in Santa Barbara, I came across a couple of wineries down near the beach and Stearn’s Wharf, and I decided I couldn’t not check them out, and one managed to lure me in with a Syrah, which according to the leaflet was sourced from White Hawk Vineyard, one of the top sites for Syrah, as used by Sine Qua Non, Ojai and others to good, if not great effect, and listed at only $24 bucks, I had to give it a try. Kalyra is an Aussie surf themed winery making small lot wines sold directly through the tasting room and their wine club, lots of Surfboards with Kalyra logos and an endless summer feel about the place, but I was happy I checked it out, because the Syrah was a delightful and interesting wine. From the cool 2011 vintage, this earthy and spicy Syrah hits all the right notes if you like a bit more restraint, which I tend to do these days with Syrah, a touch of Northern Rhone class with violets, fresh turned earth, bacon and blueberry notes along with cracked pepper, boysenberry, kirsch and minty anise. This under 14% Syrah is very tasty and a good surprise find on a lazy afternoon stroll. 2010 Tatomer, Riesling, Vandenberg, Santa Barbara County. Certainly one of the best dry California Rieslings available, the Tatomer is a lovely and stylish effort with plenty of distinct character and charm oozing from the glass from nose to finish this is impressive wine. 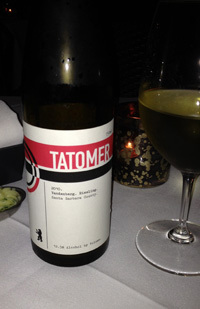 Tatomer is label to watch, the wines are pure, driven with acidity and good solid varietal examples, the Gruner Veltliner is also another terrific expression, so be sure to keep an eye out for these wines, especial the Vandenberg Riesling, a wine that made my meal at the famed Santa Barbara restaurant, the Wine Cask. The Tatomer Riesling 2010 Vandenberg starts with hints of orange flowers, tropical notes and chalky minerals with lots of citrus leading to a lively and energy filled palate with apple, lime, peach and white currant along with saline, wet stones, verbena, petrol and lemongrass. There is a forceful burst of acidity and intensity, but everything turns polished with food and air, there is a graceful creaminess that shines through and lingers on the dry, crisp finish. This highly enjoyable white is evolved and maturing nicely, it should drink well for another 3 to 5 years, but no reason to wait really. 2010 Meo-Camuzet, Marsannay AC, Red Burgundy, France. 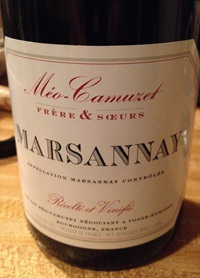 This marvelous Pinot Noir from Marsannay and crafted by Meo-Camuzet Frere & Soeurs is cool and crisp with the best of the vintage character, with a nice full dark ruby color, pure Pinot fruit and soft mineral tones. A huge fan of this wine, I am convinced this might be one of my favorite versions ever, it just touches all the emotional zones and the senses in a way that only a fine Burgundy can, it is not as fruit forward as the flamboyant 2009 and is certainly elegant and trim in body without losing it’s appealing nature. The nose is subtle, you need to wait and coax to have the inner perfume be revealed, then light violet and rose petal notes come forth, there is a mineral streak, black currant and a whiff of tea and fennel before then palate transition to crisp plum, black cherry, currant and raspberry/strawberry layers, along with cinnamon, stones, saline and the faintest hint of wood. This wine is fresh, balanced with good acidity giving good tension and drive throughout with a lean body and wonderful dreamy finish, I’m glad I bought a few more bottles, this is truly my kind of wine, drink from 2014 to 2019. *I know this is hard to find, but I do recommend you search it out! 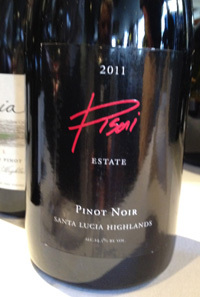 2011 Pisoni Estate, Pinot Noir, Santa Lucia Highlands. This massively appealing Pinot Noir from the Pisoni family is hugely entertaining and pure, but easier to enjoy young than most recent editions, this wine, while structured and deep, is more in this vintage an open and giving wine. Jeff Pisoni, the winemaker here, has captured the Pisoni character in this rich and textured Pinot Noir, even in a most difficult year, in fact it is one of the best 2011 wines I’ve tasted, so kudos to the farming, the place and the talent that went into what is in the bottle. The 2011 Pisoni Estate Pinot shows dark ruby/purple color, bright fruit, floral notes and briar intensity in the nose and upfront before opening smoothly into a full throttle effort with blackberry, morello cherry, tangy currant, plum and loganberry fruits, along with cinnamon stick, mocha and mineral spice, finishing with touches of violets, earth and vanilla. This is classic Pisoni, but with a refined polish and a bit more acidity, less tannins than normal, a welcome and nice surprise, I’d say this is stylish early drinking Pisoni with all the charms you’d expect from this estate, drink from 2014 to 2020 or so, if you can wait, I doubt I could or would! This wine is certainly a naughty pleasure, alluring and amazingly well crafted. 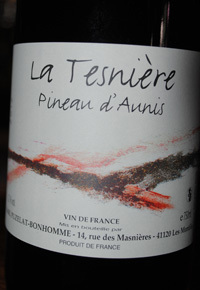 2012 Puzelat-Bonhomme, Pineau d’ Aunis “La Tesniere” Loire Valley, France. Puzelat’s rare and natural Pineau d’ Aunis is wild and unique red from the Loire Valley, Pineau d’ Aunis is a native Loire grape that has been around at sine 1100 AD and was a royal court favorite in Britain as far back as 1247. In many ways similar to Pinot Noir, this pale colored grape can make for an interesting red, though in many cases it is used in sparkling, or regional blends and sometime even a white wine, when it is bleeder off without skin contact. Not as pale as some of Jura varietals, like Poulsard, Puzelat-Bonhomme’s 2012 has a pretty light ruby hue, a spicy herbal nose with hints of flower petals, mineral and truffle earthy essence, leading to a bright palate of cherry, strawberry, raspberry and tangy plum fruit. The is subtle and vibrant wine, silky tannins and zest acidy hold things together, also being a very natural wine it does have a slight raw edge and needs to be kept cool in much the same way you would with Beaujolais, I have no idea how this fun will age, so best to enjoy this lighter style red now. It is full of pleasure and way off the beaten path. 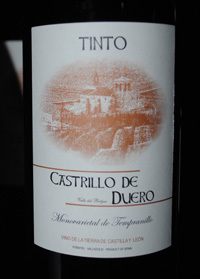 2011 Alfredo Maestro, Tinto Castrillo del Duero, Spain. This is fast becoming one of my favorite Ribera del Duero wines, from the talented Alfredo Maestro, a producer than doesn’t label it thus, preferring to keep his independence. Alfredo Maestro wines mostly come from distinct single parcels or single crus (vineyards), he is capturing terroir and the vines sense of place in unique areas in central Spain from Madrid to Ribera del Duero. The latest release is the rich and darkly detailed 2011, a wine that is hard not to love with nose of morello cherry, dried flowers, raspberry liqueur and soft wood notes, leading to a lush palate of blackberry, cherry and loganberry fruit along with hints cranberry, baking spices, mineral and poached plum, all bright and slightly tangy, with a touch of black licorice before the finish, which turns creamy with warm toffee essence, giving a bit of sweetness. The lingering effect is impressive and seductive, Alfredo Maestro is an artisan winemaker that is ever challenging the boundaries and exploring new paths, be sure to taste his wonderful wines when you see them, especially this monovarietal Tempranillo, drink from 2014-2020. 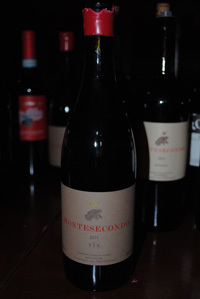 2011 Montesecondo “TIN” IGT Rosso, Tuscany, Italy. Having been influenced by Alto Adige’s Foradori, Montesecondo has made a 100% Sangiovese aged in amphora with amazing results, this cuvee from Chianti Classico grown grapes is a stunning wine of distinction and seductive charm. Raising wine in ceramic vessels is an ancient art and craft, and it is coming back in fashion, not just in the making of geeky or orange style wines, in fact Bordeaux has some top Chateaux that are using amphora, including the famed Chateau Pontet-Canet, they even make the vats from the clay rich soils of their Pauillac estate. To me it seems, amphora gives the texture and expansion that wood does without inputting the footprint on the wine, but there are many stylistic reasons as well, it allows for the fruit to show more intensity and terroir purity maybe, but also the skins and lees give added savory details. Regardless of how this wine was made and aged, it is a lovely and glorious Tuscan red with heightened expression and dynamic flavors, the Montesecondo TIN shows dried flowers, sweet herbs and wild strawberries on the nose with mineral notes throughout and a rich palate of medium weight with black cherry, boysenberry and plum fruit, soy/balsamic notes, sweet lavender, spiced tobacco, pepper and framboise elements as well. This beauty is transparent and graceful with a subtle build up of density with air, the balance is suburb and the finish goes on and on. This refined and complex Sangiovese is something rare and special, drink from 2014-2024. 2011 Louis-Antoine Luyt, El Pais de Quenehuao, Chile. This exciting and unique Chilean wine is made by Louis-Antoine Luyt, a young natural winemaker using the Misson Grape, from 250-300 year old vines, also known as Listan Prieto or Pais de Quenehuao locally, these vines are on original roots and re-started with old school pruning techniques, but have never had to have been re-planted since the Spanish Mission days. This is a wine that brings us a first taste of what wine in the new world first tasted like, and while winemaking, natural and otherwise is far better than it was, this provides an interesting glimpse back into wine history, and a tasty one at that! Luyt is crafting some intriguing wines and is a rising star, he is showcasing varietal and terroir that hasn’t been seen much in imported wine from Chile in my generation, these are wines of unique character and style, crafted in small lots and done with passion and integrity. 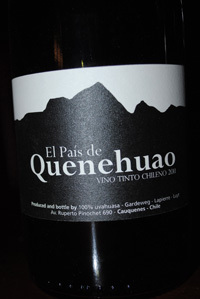 The Pais de Quenehuao 2011 is bright, tangy and vivid red wine with cherry, plum and blueberry fruit, along with zesty acidity, mineral tones, sweet herbs and exotic spices. Luyt says the clusters were affected by the massive earthquake that hit Chile in 2011, he believes the wine itself is reflecting that big shake and tastes different than other vintages, this is truly a wine that transmits the heart of it’s place. Luyt used whole cluster with a light pressing, this leaves a bit of structure and allows a more upfront fruitiness to show through according to his line of thinking, he also says this vintage is more about early drinking, thinking it should be enjoyed in it’s 2-5 year life ahead, I think it is delicious now and that it should drink with grace for about 5 years. There is a pomegranate, red peach and strawberry aftertaste that I really enjoy here and I think this is a fun and totally cool wild and wacky appealing wine. This wine is a rarity and will be hard to locate, but be sure to ask your merchant to get some, imported by Farm Wines, California. Also be sure the more easily found Luyt Carignan 2012 from Chile as well, this is another gem from this quality producer.